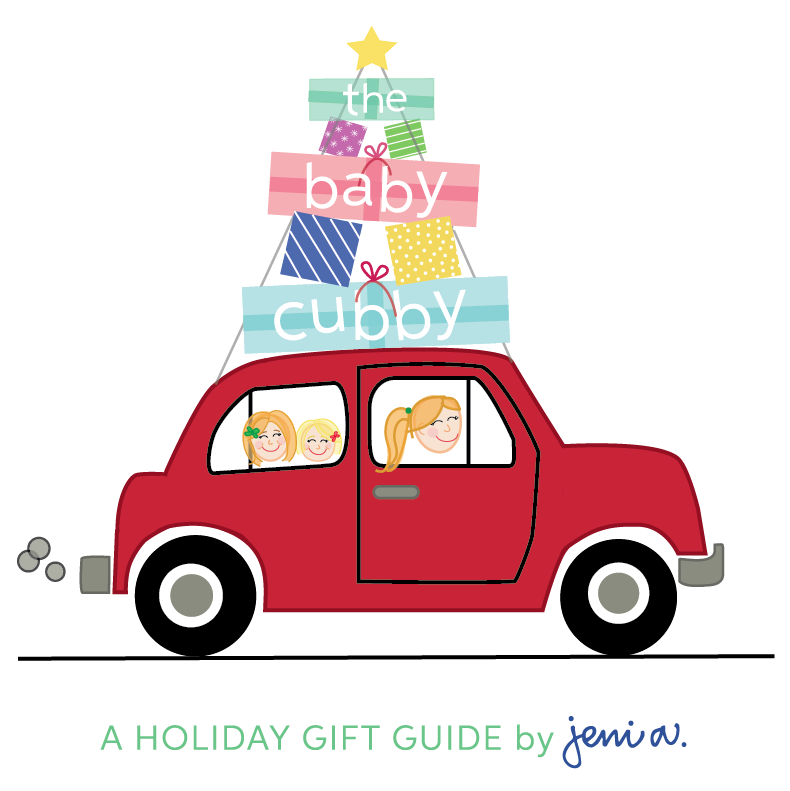 CHRISTMAS WITH THE BABY CUBBY! 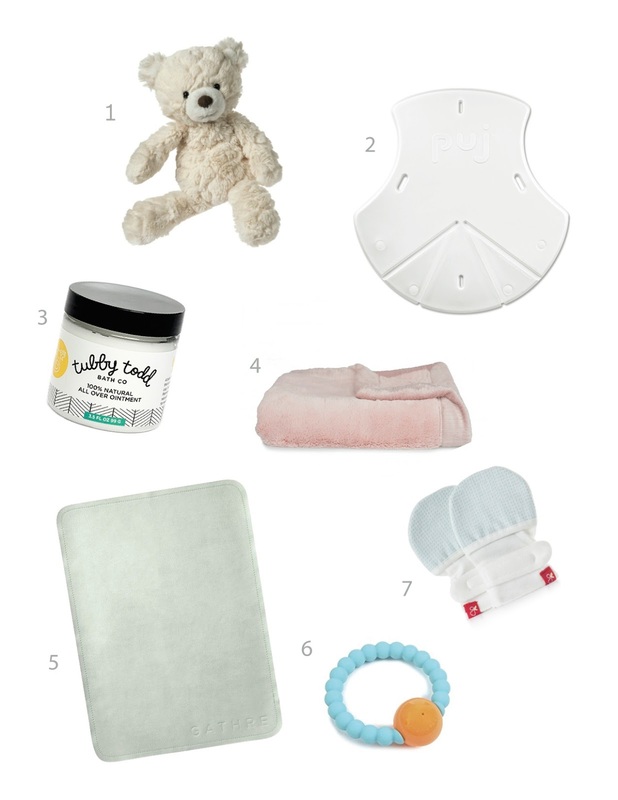 14 AFFORDABLE GIFTS FOR OUR TINY BABES + TODDLERS | jeni a. However, I have to honestly admit that I was super tempted to not put a price limit on the gifts I found, since the store has such an impressive array of the more expensive, must-have gear that I listed up there. Ryan and I are eyeing the car seats, in particular, for Baby Sister, and since The Baby Cubby price matches, we'll go back and snag one from them. Ry's first gotta find the cheapest, best deal on the planet for the car seat - that's his "thing" (and thank goodness, because his spending strategies saves us major pennies). I compiled two guides - one for our tiny babies and one for our toddlers. See everything below! 1. Mary Meyer Cream Putty Bear. $15.00. Every baby needs a soft, squishy friend. Both Olivia and Claire have a special stuffed animal - Olivia loves Moose, Claire loves Bear - and they're part of the fam. I wish Claire had this supple, cream bear, though, for the sake of its color. It's pretty! 2. The Puj Tub. $45.00. And every home needs a Puj Tub. I bought ours when Claire was born and loved it since it's sooo easy to use. I also love that for the last 1.5 years, the tub has been FOLDED UP in the nursery closet, taking up no storage space. Major win. 3. Tubby Todd All Over Ointment. $12.00. This stuff is MAGIC. I don't know how, but it is. It wears like a cream, and it takes care of any kind of cut, scrape, or burn after 1-2 uses. Diaper rashes, especially, don't stand a chance (it puts Desitin to utter shame). This year I started to gift this Ointment only at baby showers, since it's been such a game-changer in our house. 4. Saranoni Receiving Blanket. $42.00. Every child needs a special blankie, too -- and yet Olivia has never had one 🙈 so I snagged this exact Saranoni blanket for her over Black Friday. For someone on a student budget, the $42 feels a tad pricey for a blanket -- until you have the piece of HEAVEN in your hands + you realize that you got what you paid for. We are in love! 5. Gathre Micro Mat. $20.00. You know I'm sliiightly partial to this product. 😉 I started Let's Playground, which was Gathre's former business name (see the background here and here), and I love the Micro. I call it the "gateway mat," since it will get you hooked on the novel concept of the mats being being easy-to-clean and stunning in one go. Every mom needs two Micros, in my book - one for the backpack, one for the nursery. We love our mats! 6. Goumikids Mitts. $12.00. Definitely getting some of these for Baby Sister. I used socks on the other girls (bless them for their patience) so I'm glad I found these. They look roomy enough for tiny fingers to still wiggle around, which is what I'd want if I were a baby wearing mittens! 7. Chewbeads Rattle. $14.50. Why are silicone teething toys so amazing?? Claire died over this silicone teething necklace that I had, but I didn't love wearing it, so this product strikes the balance. And it's a rattle. 🙌 I'll be grabbing this for Baby Sister, too. 1. A to Z MagnaTab. $30.00. This! Genius. I've been wanting to design some alphabet tracing sheets for Olivia since she's writing letters more and more, but I'm getting this number instead. We won't have to re-print anything, and I love that the magets will pop up into place when she traces the letters. 2. All Aboard Books! $10.00. We love these books. Sweet Aunt Annie snagged the CA and DC books from The Baby Cubby for Olivia's birthday this year, so we've had them around and they are just treasures! Get one or two in the places you've lived or traveled to, and re-live those worlds with your babies (over and over and over again). It's the best! 3. PlanToys Mini Golf Set. $30.00. I want this for Ryan the girls! 😉 Ryan is a golfer, and I can see the thrill in his eyes already via playing with this one with his dolls. The toy's gender neutral colors are spot-on, and having an easy, indoor ball game during the winter is amazing. 4. Boon Creatures Bath Toys. $12.00. Super great bath toy. They are larger than the picture above depicts, and since they can be played with in so many different ways, I imagine the girls would stay happy with them for a loooong time. 5. Star Magnifier. $5.00. Can't get simpler than this, but I love these kind of toys since they require so much of your child's imagination. I can see Olivia leading Claire on some serious excursions through the house (and then Claire will grab it from her and they'll fight), then Claire will lead (then Olivia grab it from her...😂😉). 6. ZOO Pack Backpack. $20.00. A staple! Olivia has the Panda Bear Backpack - she uses it for school and as her personal item whenever we fly. It's time for me to get a backpack for Claire, since she's old enough to have her own loot when we travel, and I'll be snagging this one. All the ZOO Packs are darling and totally affordable (designer kid backpacks can get $$$)! 7. "And Then..." Story Starter Book. $25. Talk about the kind of gift that keeps on giving! The girls are on a "tell me a story" kick right now - like stories from my brain - which is great and also exhausting (I can only stay creative enough for so long!! ), so this is coming to our nursery's library. That's it! 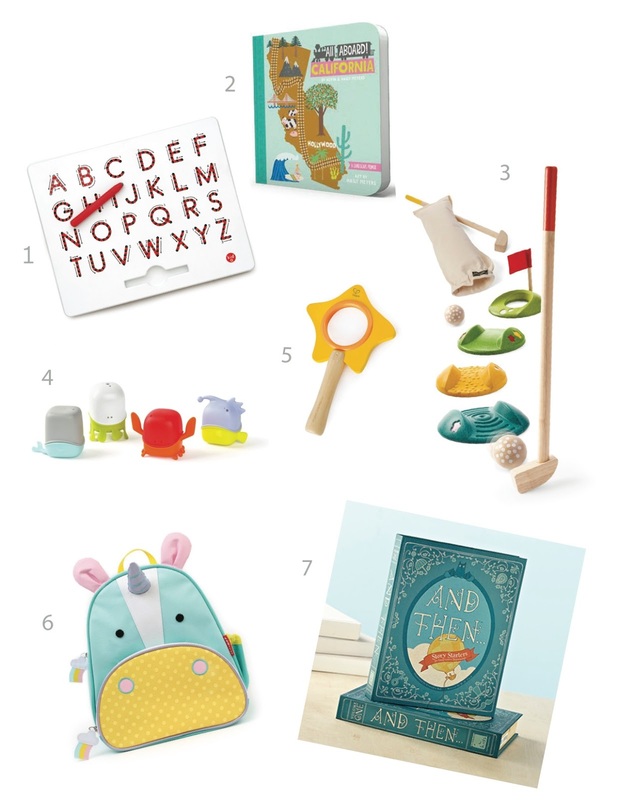 I saw on The Baby Cubby's Instagram feed a couple days ago that they're offering 20% off their toys right now, too, so go snag something while you can. And to The Baby Cubby - thanks for having me! PS, I have a tiny spiel on why I care to both work with + buy from small business like The Baby Cubby - you ready for it?? - they have souls. Real, relatable souls.